I am honored once again to be part of this great and important blog hop. We, as GLBTQ people, have made some amazing strides on the national and state levels. I never guessed even a couple years ago that my state, the state of Minnesota, has marriage equality. It’s been an incredible ride and I get to celebrate by getting married this fall to my partner, Steve. While there have been a lot accomplished we still have much to do. There are laws to change, attitudes to soften, and people to educate. Each of us do that on daily baisis whether we realize it or not by living a free and proud life. We have the chance to support each other and those who still live in fear by being an example or being there to listen. I am incredibly blessed to have been able to write a book, The View From a Rusty Train Car and a play, Once… and Again (Writers AMuse Me Publisto bring some attention to GLBTQ issues to the national stage in some small way. Everything we do counts. Celebrate the wonderful diversity of our world and celebrate the International Day Against Homophobia and Transphobia on May 17th. http://dayagainsthomophobia.org/. As part of the celebration I’m giving away two digital copies of my book, The View From a Rusty Train Car. The winners will be picked randomly from whomever replies to this post. Contest ends May 27th, 2014. Winners will be announced June 2nd. There are many places to visit and incredible people to meet on this hop! 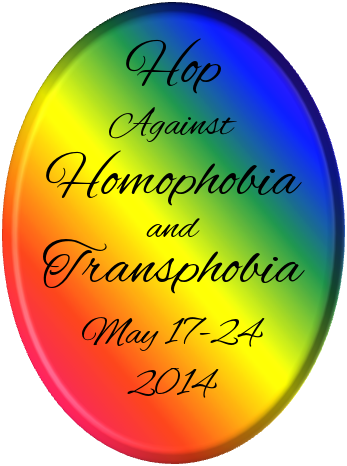 Please find the complete list here: http://hopagainsthomophobia.blogspot.com/. Thank you so much for stopping by and keep up the great work on the path to equality and the destruction of homophobia and transphobia. Stay strong and always choose love! ← A New Chapter for Writers AMuse Me Publishing… and me. Thanks, Lee! Hope all is well! Nice post, DeeJay. And oh my gosh, congrats on your upcoming nuptials! Your book just went on my TBR list as well! Congratulations on your impending nuptials! Thank you so much, Trix! Your blog post is short and sweet. I have also always believed in the message you tried to give through it. “Everything we do counts.” We have in us the immense potential to change the world. Well put. We really do and we can see that it works. We’re seeing it every day. Thank you so much, H.B.! Thanks so much! Thank YOU for taking part in it and for all you do! Thanks for hop and congratulations to soon to be wedding. Congratulations on your upcoming wedding! I hope it’s a fabulous day filled with all the happiness and joy you deserve. Thank you so much, Anastasia! Thanks for taking part in the hop! Congratulations!!! I enjoyed your post. Thanks for being part of the hop.